By every measure the stock market is historically over-valued and long overdue for some sort of a correction. 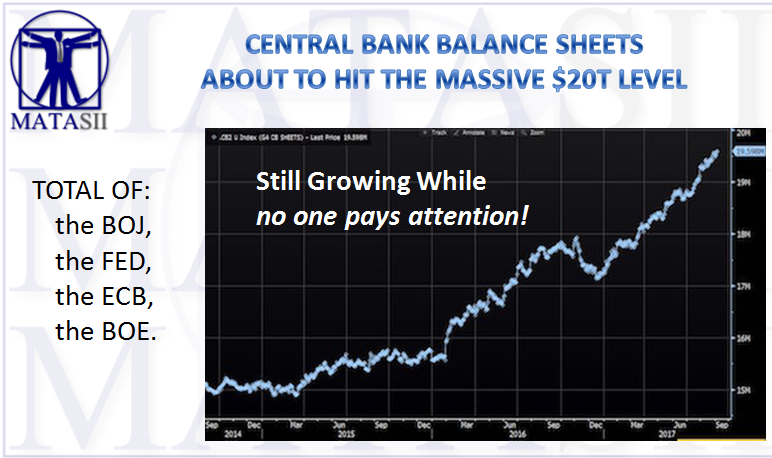 We have just experienced the third biggest and second longest central bank-sponsored bull market in history. Normally the more over extended markets become, the more serious the correction. In this regard without so much as a significant market retracement and consolidation during this this run-up, the next correction should no doubt be a real "dozy"! ! However, a serious correction would now wreck unprecedented damage and likely be the start of an unstoppable avalanche due to the over reaching degree of excess financial leverage existing in the global financial system. The central bankers are no doubt acutely aware of this and as such this was the prime responsibility of the Federal Reserve's Co-Chair Stanley Fisher - to prepare the Federal Reserve (and likely to coordinate the other central banks planning efforts) for this possible inevitability. But how does one prepare for something of this scale? How do you unwind the trillions of central bank liquidity injections, unintended consequences and moral hazard that has run unchecked since the introduction of QE and ZIRP? To me, it will take something as equally large and as unprecedented as the Monetary Policies that we have already witnessed over the last 8 years. After the 2000 Dotcom Bubble Implosion the public demanded that those be responsible be prosecuted. Blame was pinned on who ever was even remotely culpable as Tyco, Enron, and WorldCom executives for example were publicly handcuffed and paraded off to jail with broad media coverage. 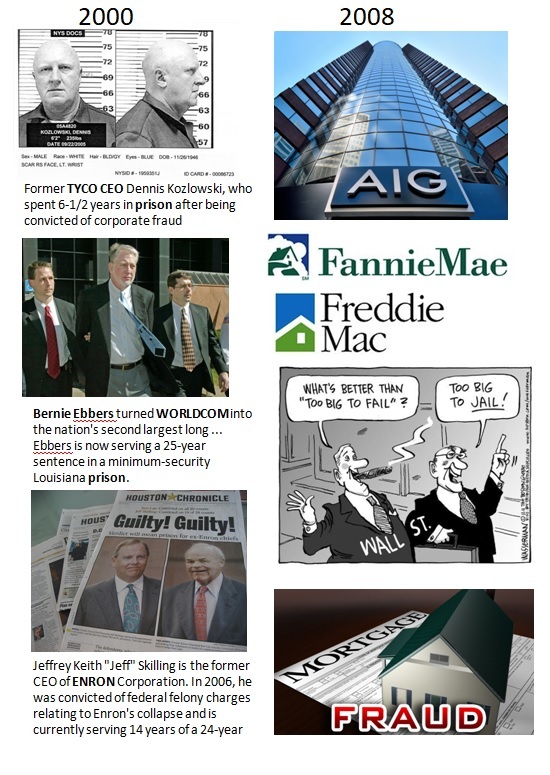 After the 2008 Crisis, AIG, the "Too Big to Fail Banks", Fannie & Freddie were 'brought to kneel' through massive new regulations such as Dodd Frank. In the 2000 debacle those hurt were investors and institutions participating in the market speculation. During the 2008 Financial Crisis, the public picked up the bill through government sponsored bailouts. Those directly impacted by mortgage fraud were made whole as best as could be managed. The political pressures to appease and "make whole" those impacted was immense. It will likely be even greater during the next crisis as public sentiment will be completely lacking in tolerance and the financial ability to cope! 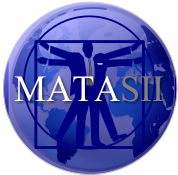 The next crisis will be different as everyone will be impacted whether they were directly participating in the market or not. There is a strong possibility that the next crisis will destruct an already underfunded pension industry. An industry despite historic increases in financial prices is already near collapse as 10,000 baby boomers per day are now retiring! This will financially decimate innocent holders completely dependent on their pension income. Governments will be held politically responsible to make these 10's of millions of citizens "whole" or minimally 'survivable'. We are also likely to see Insurance company Annuity products become insolvent as well as credit to seize-up. With 70% of Americans now living paycheck to paycheck and being forced to survive on a daily basis on this previously ever expanding credit availability, it won't be pretty when the 'life support' in withdrawn. Political action will be demanded while Wall Street manipulators and the stock market will be blamed! The public will expect an already heavily regulated stock market to be even more controlled so this never happens again. Expect bills such as "The Market Stability Act" to come forward which will effectively 'Nationalize' the stock market via government asset guarantees and stock purchases. Reuters trial balloon from last September indicated that the "ECB may be forced to buy stocks." while ABN Ambro indicated in September 2016 that "Any ECB scheme to buy stocks could total 200 billion euros". In Euroland today investors are wondering when the ECB is going to start crossing this frontier and step into equities - as a means to circumvent the "unwelcome" scarcity of government bonds and ownership limitations. Will this be the main policy tool of last resort in a next crisis/crash? "Well, the Federal Reserve is not permitted to purchase equities. We can only purchase U.S. treasuries and agency securities. I did mention in a speech in Jackson Hole, though, where I discussed longer term issues and difficulties we could have in providing adequate monetary policy. Accommodation may be somewhere in the future, down the line that this is the kind of thing that Congress might consider, but if you were to do so, it's not something that the Federal Reserve is asking for". "Yellen’s tentative openness to changing the law suggests Fed officials have been giving a lot of thought to new ways to jolt the economy in an era of low inflation and low interest rates." All of this is not actually that dramatic when you consider the degree to which the central banks already control and participate in the markets. 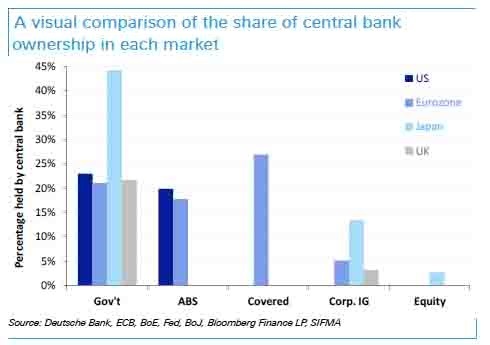 The European Central Bank (ECB) and Bank of Japan (BOJ) balance sheets exceed 35% and 70% of their GDP. The Bank of England (BOE) owns between 25% and 30% of the UK’s sovereign debt. BOJ: Bank-based Japan, with a relatively less developed corporate bond market, the BoJ has amassed roughly 13.5% of the market. BOE: In the BoE case, the CBPS has brought its ownership of the UK IG corporate bond market to about 3.1%. ECB: The ECB's CSPP has brought its ownership of the Eurozone IG corporate bond market to 5.1%. Unlike the BoE which has stopped the CBPS, the CSPP number is expected to grow as the program continues for many more months. 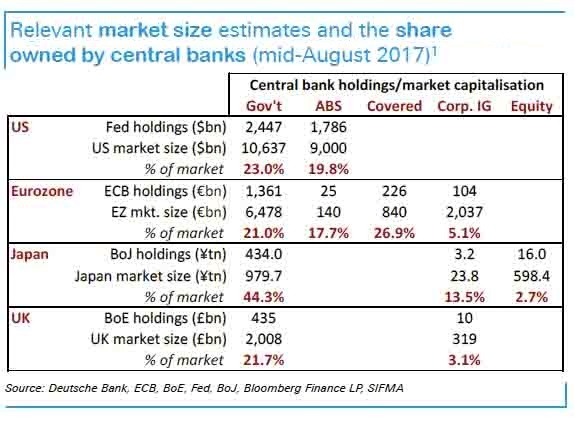 The BoJ conducts purchases of equities as part of its QQE (Quantitative & Qualitative Easing) and Deutsche Bank estimates that the BOJ effectively holds nearly 5% of the Japanese stock market. The BOJ is on course to become the largest shareholder of the Nikkei 225’s largest companies. 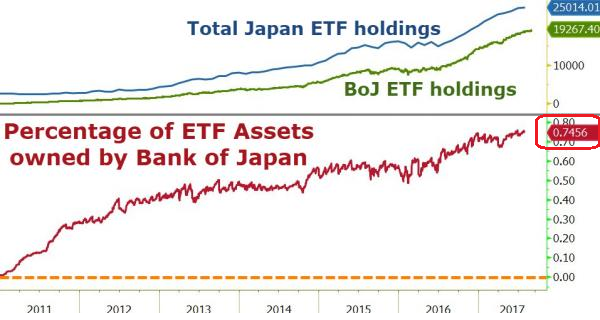 In fact, the Japanese central bank already accounts for 60% of the ETFs market (Exchange traded funds) in Japan. Over time the BoJ has become increasingly important. Its share of the Japanese stock market has risen from 0% in late 2010 to now 5% (see chart below). This has been funded from thin air, i.e.by simply printing money. The interesting point is that the incremental gains of one percentage point in ownership are realized in an increasingly shorter time period. It took 4 1/2 years to reach 2%, but only 2 1/4 years to add another 3 percentage points (to the current 5%). This reflects two patterns: the declining positive impact of BoJ buying on stock prices and the increase in buying volumes by the central bank. It used to be that just the BOJ (via ETFs) and the largest Japanese pension fund, the GPIF (the largest in the world), had an implicit green light to allocate funds (in the case of the former, created out of thin air) to equities. That is no longer the case: according to Bloomberg, Japan's second largest commercial bank, Japan Post Bank Co., has decided to follow in the footsteps of its giant peers, and plans to "plow" an 100 billion yen ($904 million) directly buying stocks "when it finds the right opportunities." At some companies, the BoJ seems to have already reached a visible double-digit stake (e.g. at Fast Retailing). Is the BoJ going to control private companies? What is going to happen when the BoJ tries to exit the stock market again? Can a stock market crash and/or recession be avoided? What happens if the BoJ is not able to exit due to economic cooling/declining stock prices and the resulting public outcry. If one extrapolates the recent gains in ownership to the future - and does not assume another decay of the positive impact on stocks or any further increase of volumes - it will take only 13 years and the BoJ owns one quarter of the Japanese stock market. Ultimately, the BoJ is nationalizing the stock market and thus eroding one fundamental pillar of a market-based economy (bear in mind it already "owns" the government bond market). The Swiss National Bank as an example has been on a steady and aggressive buying spree. In the second quarter, following record purchases in the first quarter, the central bank boosted its total equity holdings to an all time high $84.3 billion, up 5% or $4.1 billion from the $80.4 billion at the end of the first quarter. The Swiss central bank has accumulated foreign exchange worth 714.3 billion francs (over $740 billion) due to its ongoing interventions to depress the Swiss franc, and has "invested" those funds created out of thin air in stocks and bonds. At the end of the second quarter, it held 20% in equities, of which the bulk was in US stocks. "While we are far beyond the point of debating central bank intervention in equity markets (we do want to remind readers that until several years ago, it was considered "fake news" to even mention it, and those who accused central bankers of manipulating stock markets were said to be paranoid tinfoil basement dwellers), we want to point out that unlike the BOJ, which at least keeps its capital markets distortion local, the SNB, which likewise creates money out of thin air (then sells it for dollars in an attempt to keep the Swiss franc depressed) is actively causing substantial price distortions in the US. 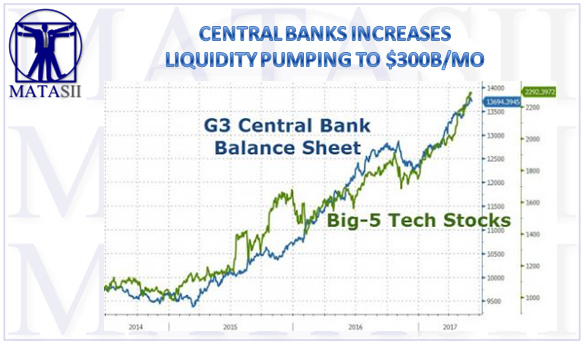 While we doubt this will be investigated with stocks are at all time highs, we look forward to the Congressional hearings after the crash when the scapegoating and finger pointing begins, and everyone is "stunned" to learn that central banks were responsible for blowing the biggest asset bubble the world has ever seen by directly buying stocks"
It wasn't just that the SNB has bought this amount of US stock but it has been targeted specifically at the stocks carrying the indexes and ETF's higher. 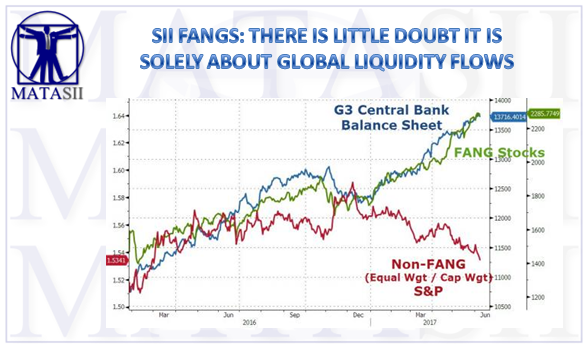 The FANG's = Facebook, Amazon, Netflix and Google; as well as Apple and Microsoft. China's "Plunge Protection Team", also known is the "National Team" is playing an increasing role in "stabilizing" Chinese equity markets for political reasons. The "National Team" has traditionally stepped in during times of market stress but is now apparently engaged in boosting sentiment even in less stressful periods. The "National Team", most recently in the form of state-backed investor China Securities Finance Corp., announced it had boosted its stake in the firm, and across the entire sector. Stocks across a broad array moved higher. Orient Securities surged by the 10% daily limit in Shanghai after China Securities Finance’s stake rose to 4.99% in 2Q. In Hong Kong, Orient’s shares jumped by a record 6.4%. China Merchants Securities rose as much as 7.6% in Shanghai, their biggest gain in a year, and 4.9% in H.K. The the same reason - China Securities Finance stake in the company nearly doubled to 4.64% in 2Q; from 2.67% in 1Q. Others followed: Huatai Securities surges as much as 9.7% in Shanghai to the highest since December 2015, climbing 4.9% in H.K. to highest this year; China Galaxy Securities advances 9.3% to highest in five months in Shanghai, up 3.6% in H.K. Ultimately, brokers - a leading sector for overall market sentiment - accounted for 6 of top 10 gainers on CSI 300 Index, which is up 1.4% at highest since December 2015, while the gauge of A-share brokers jumped 5.4% to highest intra-day since last December. It is readily apparent that Capital Markets are now a Policy tool of the Chinese government, especially as they approach their politically important National People's Congress. Ahead of the Communist Party’s twice-a-decade congress - an event so massive that according to Bloomberg "nothing escapes its pull" - which is slated to start on October 18 in Beijing, regulators have made it clear to the nation’s top brokers, bankers and financiers that they don’t want to see any major turbulence in markets. China's regulator told brokerages and futures companies to check for risks in their liquidity, operations and financial health, effectively warning that it does not want to see any selling. The regulator also ordered firms to assess their information system security and credit risks and report their findings before October, Bloomberg's sources added. So much for free markets reacting to political policy or interfering with political policy! Governments around the world are additionally already distorting financial markets by buying the financial markets through their countries Sovereign Wealth Funds. Sovereign wealth funds like Norway's have benefited immensely from a virtuous cycle of central bank buying as their funds asset value surged to over $1T on massive allocations to equity. Perhaps Norges Bank Deputy Governor Egil Matsen, the official in charge of the fund’s oversight, has some special insight into the thinking of central bankers, the primary engineers of the global post-crisis market rally. According to Bloomberg, Japan's second largest commercial bank, Japan Post Bank Co., has decided to "plow" 100 billion yen ($904 million) directly buying stocks. The bank has already set up a new structure enabling it to directly invest in stocks. What it will do in reality, is buy every triple digit PE "growth" stock it can find. Japan Post Bank’s foreign bond portfolio has a bigger weighting in the U.S. than in Europe, though it does have holdings in Germany, France and the U.K., Sago said. The company has recently cut some positions that were under-performing or had negative returns. They expect holdings of Japanese government bonds to fall as it plans to avoid reinvesting funds from maturing securities. 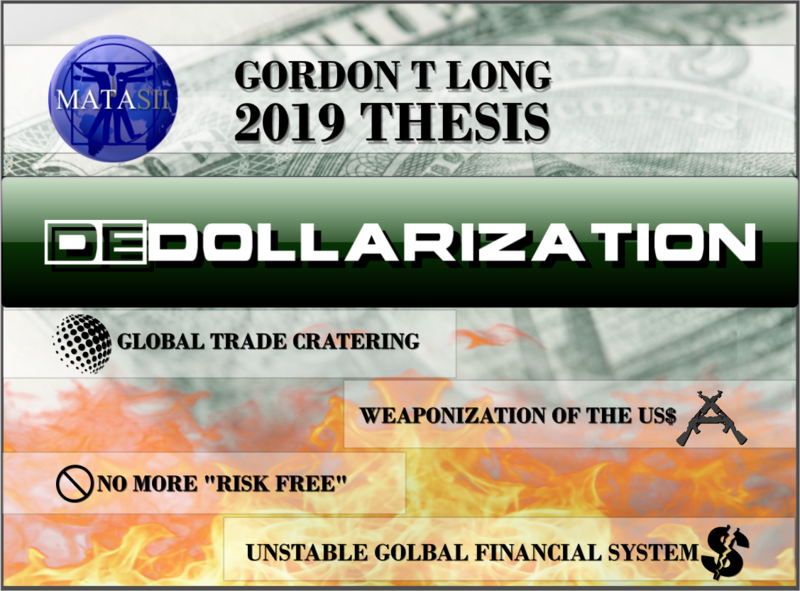 The distortions, malinvestment, unintended consequences and moral hazard created by the sustained period of Quantitative Easing & ZIRP have left global markets in perilous situation. The mispricing of risk has lead to the lack of price discovery. In a complex, intertwined and fragile financial system even a minor event can have profound and devastating consequences. We are currently positioned where this inevitability is pre-ordained. It is no longer a matter of 'if', but of 'when'! We can minimally expect a coming, long overdue US recession to be the catalyst for the next financial crisis (if something else doesn't trigger it sooner) and lead to a deep recession or worse. If this isn't the case then a looming underfunded pension and entitlement liabilities crisis in the US (and other developed economies) will ensure the inevitable. Leaders will have little choice but to respond with financial guarantees and assurances to restore the financial system. Expect the outcome to be the 'nationalization' of the stock market disguised under some very eloquent, soothing and re-assuring name - "The Pension & Market Stability Act". VIDEO TRANSCRIPTION: IN-DEPTH – TIME TO BATTEN DOWN THE HATCHES & REEF THE SAILS! 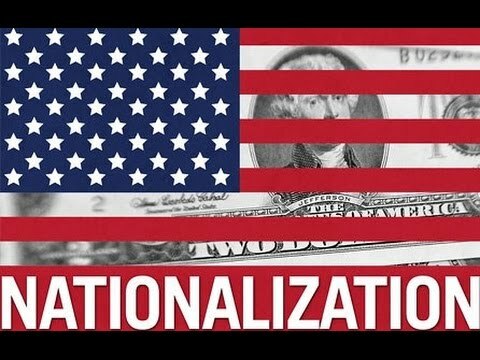 LAST FINANCIAL CRISIS USHERED IN “CONSERVATORSHIPS” & “FACILITIES GUARANTEES” – WILL THE NEXT PROGRESSION BE “NATIONALIZATION”?